A BELOW par performance by Dumbarton gave Cowdenbeath their first SPFL Championship win of the season at sunny but blustery Central Park. A BELOW par performance by Dumbarton gave Cowdenbeath their first SPFL Championship win of the season at sunny but blustery Central Park in front of a crowd of about 350. Ian Murray's men arrived at the motorsport venue, littered with huge tyres, expecting to continue their recent good form, but once again found themselves leaking goals through defensive errors. Cowden seemed more eager in the opening minutes, and probably deserved to take the lead when Jamie Stevenson danced through Sons and shot past keeper Jamie Ewings in the 21st minute. The visitors created few chances and went in at the interval a goal behind. The second half featured a stunning individual performance by midfielder Chris Turner, who netted two long range shots to give his side a 2-1 lead, and had another effort ruled off for offside. But that was not enough to give the team victory. In the 72nd minute Jon Robertson, who had rejoined the Blue Brazil from St Mirren, gave himself a welcome home present when he benefitted from a defensive blunder and lobbed the keeper. As the final whistle approached Paul McGinn conceded a penalty, but Ewings produced a great save from Jordan Morton's spot kick. A draw now seemed inevitable, but in time added on Kane Hemmings, on loan from Rangers, burst through to net the winner. 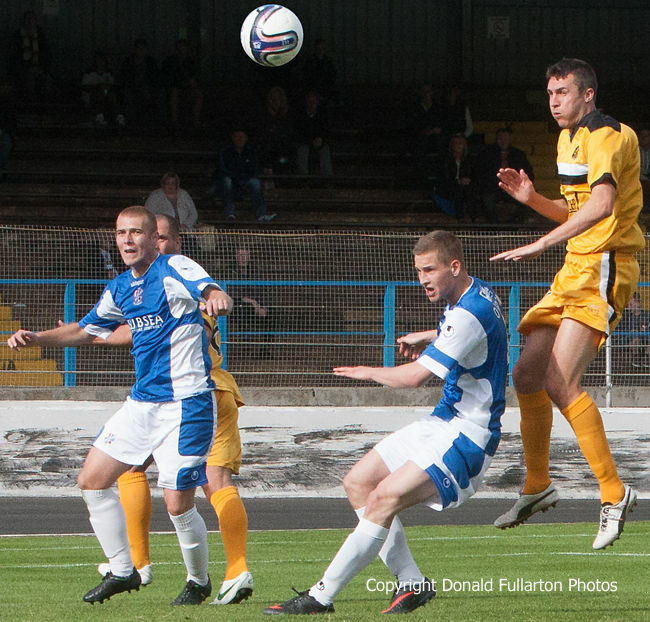 The picture shows Colin Nish heading for goal.